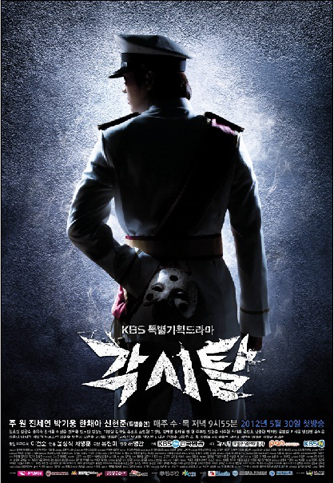 Lee Kang-To wears a gaksital mask and avenges the brutality during the Japanese colonial era in South Korea. Lee Kang-To (Joo Won) is a detective during the period of Japanese occupancy in South Korea. His father was a nobleman, possessing power and wealth, but he devoted himself and his fortune to the independence movement. His father was then killed. After the death of Lee Kang-To's father, Lee Kang-To and his mother supported his older brother Lee Kang-San (Shin Hyun-Joon), who was smart enough to enter the top university. Yet, Lee Kang-San also took part in the independence movement. He was then arrested and became an invalid to due severe beatings. Lee Kang-To, sick of the independence movement, now wants to become successful no matter what. He then becomes a detective. A month prior to the funeral of Lee Gong, a high ranking officer, Lee Kang-To captures a fighter from the independence movement. His name is Mok Dam Sa Ri (Jeon No-Min). Lee Kang-To is then promoted to a deputy assistant commissioner. At Lee Gong's funeral, Mok Dan (Jin Se-Yeon) throws a stone at the picture of the deceased high ranking officer. Lee Kang-To and other detectives capture Mok Dan. At this time, the masked Gaksital appears. Gaksital saves Mok Dan from Lee Kang-To and escapes. Later, Mok Dan is able to attend the trial of Mok Dam Sa Ri and the other fighters from the national independence movement. She then witnesses her father receiving the death sentence. Mok Dan then jumps out and fights Lee Kang-To and the court police to save her father. Mok Dan is captured and again faces Detective Lee Kang-To. Then, Gaksital appears and fights Lee Kang-To. During the skirmish, Mok Dan and her father are able to escape.